The Rockwell Community, composed of Rockwell Land, Rockwell Club, Power Plant Mall and the Rockwell Center, invites everyone to Love Japan, a one-of-a-kind bazaar and auction on July 23-24, 2011 for the benefit of Japan’s rehabilitation following the devastating earthquake earlier this year. 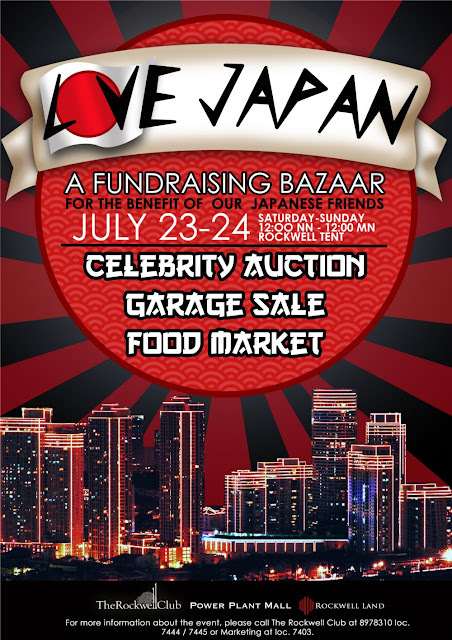 The Rockwell Community, in partnership with the Japanese Embassy, is putting together the Love Japan project to raise funds for the Japanese citizens and the rehabilitation of their country. All the funds raised will be donated through the Japanese Embassy. The cause is especially dear to Rockwell as the Rockwell community has many Japanese residents. “As an integral part of our close-knit Rockwell neighborhood, we would like to give back, in our own little way, especially since our Japanese brothers and sisters have continuously been supportive of Rockwell throughout these years,” says Mr. Harry Liu, a member of Rockwell’s Board of Directors. (1) Sell or Donate. If your closet or home is overflowing with furniture, appliances, gadgets, toys and clothes that you don’t need, you can sell them to help Japan! Food booths are also available. For those who don’t have enough items for a booth, donate an item or two through the Rockwell Club and Rockwell will sell that for you and consider it your donation. (2) Shop, Dine and Enjoy. The shopping possibilities are endless in this special weekend souk, composed of unique bazaar items from Rockwell tenants and collections from select brands from Power Plant Mall selling at discounted prices! There’s fun for everyone as Rockwell adds to the festivities with Japanese-themed activities like a CosPlay Competition and Anime Festival on July 23 and a Jamming for Japan mini concert on July 24. (3) Bid. Rockwell’s friends from society, fashion, film and television will be donating items for auction. Join the bid and buy pre-loved luxury goods at unbelievable prices. Items are up for grabs at the silent bidding on July 23-24 (until 3pm) and during the live auction on July 24 on Sunday, 6:30pm. Some of the items up for auction are paintings from celebrities and signed boxing gloves from Manny Pacquiao! For those interested to donate or participate in the activities, please call the Rockwell Club at (632) 8978310 loc. 7444 / 7445 / 7403 or at +63.917.8071739. 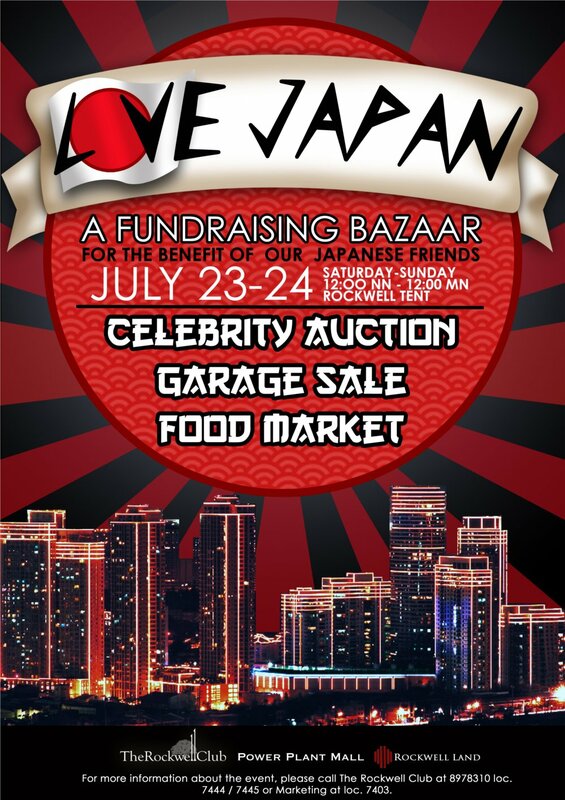 Together, let’s show how much we LOVE JAPAN as we shop, dine, sell and bid!